If you've ever wondered what makes an exceptional bank stock, then look no further than New York Community Bancorp. Over the past 20 years, it's racked up a total return of more than 3,200% for its shareholders. Here's the secret to its success. For the past two years, I've expounded on the virtues of New York Community Bancorp (NYSE:NYCB). It is, in my opinion, one of the best-run banks in the country -- though this isn't to say it doesn't have its own unique set of challenges. I trust that the chart above is sufficient proof as to why I hold the New York-based bank in such high regard. It shines even when compared against the undisputed gold standards in the industry: U.S. Bancorp (NYSE:USB), M&T Bank (NYSE: MTB), and Wells Fargo (NYSE: WFC) -- which, mind you, are also exceptionally well-run lenders. How, pray tell, has it accomplished such an impressive feat? Beyond prudent risk management and highly opportunistic acquisitions, it hasn't wasted shareholder capital. That is, instead of carelessly buying back stock like so many of its competitors have over the last two decades, it distributed the money to shareholders in the form of dividends. At a time when banks continue to eschew dividends in favor of buybacks -- I'm looking at you, Bank of America (NYSE:BAC) -- I think this is a very important lesson for both analysts and investors to internalize. 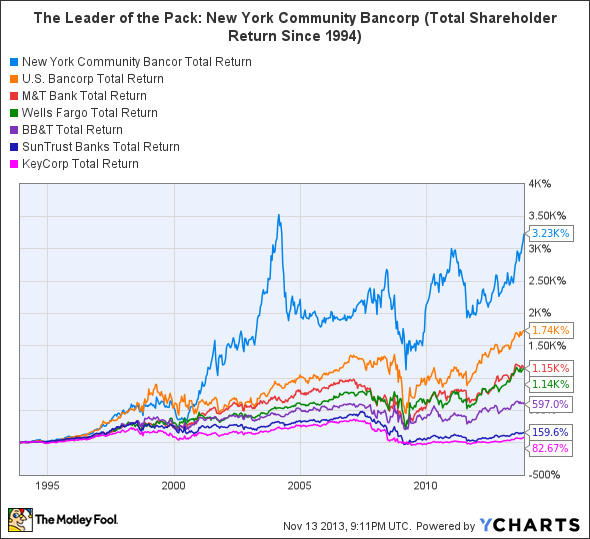 Put simply, it isn't a coincidence that New York Community Bancorp has outperformed the industry at the same time it paid out the largest share of earnings via dividends (with the exception of Huntington Bancshares, which isn't worthy of inclusion given how much it diluted shareholders during the financial crisis) and bought back the smallest relative proportion of common stock. Think about this the next time you hear someone praising the virtues of share buybacks.